Note: AminoSerene does not ship to Japan. Orders to a Japanese destination will be refunded. 60 capsules per bottle - 10 bottles: 10 months' supply - even bigger savings and save on shipping too. Improves psychological and endocrine stress, reduces blood sugar, cortisol, and fatigue, promotes positive mood and improves memory, with the power of YTE® balanced amino acid complex, Sensoril® Ashwagandha, Citrulline and botanical complex. When we discovered our YTE® supplier's own secret formula, we persuaded him to let us buy a small quantity. This industry veteran in raw materials and formulation knows a thing or two about formulas ... and he's one of the rare 15-25% of people on the planet who - probably like you, as you're reading this - who are conscious. AminoSerene has been blended and bottled in one of our favourite, cGMP factories - in fact, the world's leading manufacturer of nutritional formulations, in the USA. This is a rare Limited Edition so we can see whether this secret formula is what you want, and popular enough for us to manufacture a whole new batch. Of course, every single ingredient matches our usual extremely high standards. We have a small number of bottles available, shipping to lucky ones who order now. 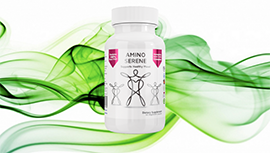 The ingredients in AminoSerene’s unique proprietary formula promote higher levels of energy and stamina, more restful sleep, stronger memory and improved mental focus, increased muscle strength, less stress and anxiety, elevated serotonin levels to raise your mood, faster recovery from exercise and exertion … so you feel great again day and night. AminoSerene helps you get the most from your sleep, from your food, from your daily activities, so you live life to the full. This revolutionary formula with genuine ingredients at the right dose has been carefully developed with our total commitment to your needs. We are not an MLM or pharmaceutical company and have a policy of Always Honest Pricing, so you get the best value for money as well as premium ingredients every time. AminoSerene contains 300mg of pure Norwegian YTE® in every capsule plus Sensoril® Ashwagandha all within a powerful botanical supportive formula. So you get 600mg YTE within every serving. Of course, our Worldwide 30 Day Triple Guarantee applies to AminoSerene just like all the Get Your Boom! Back products. With this Money Back Guarantee, you have nothing to lose. We all love to make life easy. When you choose to Subscribe & Save for AminoSerene, you'll get your order every one, two, or three months - your choice - without having to remember to reorder. Choose the Subscribe & Save Option to Save Your Valuable Time and Money With Auto Renew. YTE® is a highly absorbable bioavailable source of the 22 most required Amino Acids by the human body. The human body is comprised of approximately 20% protein and Amino Acids are the basic building blocks of all proteins in the body. YTE® is a patented food supplement developed and patented by the Norwegian government and made exclusively in Norway. Why is it called YTE®? YTE® was first discovered back in 1929 by a Canadian Doctor called John R. Davidson. He was observing fertilised hen eggs and realised that on day 9 of incubation the egg went through an incredible growth spurt that caused a tripling of the embryo inside the egg. He hypothesised that the nutrients inside the egg on this ninth day must be very powerful if they could cause a tripling in the growth cycle that was enough for a fluffy chick to hatch just 12 days later. Dr. Davidson then began successfully treating his patients by injecting the YTE® nutrients but he died just as he was seeing success with his technique and his research was lost for almost 50 years. That was until 50 years later when a Norwegian scientist working with the Norwegian government made the same discovery as Dr. Davidson that the fertilised hen egg contained very potent nutrients on the 9th day of incubation. As nutritional and scientific understanding had advanced a lot since 1929 the Norwegian scientists understood immediately that the nutrients extracted contained a special combination of amino acids and protein fractions including a complete array of 22 Amino Acids, vitamins, minerals, proteins as well as some very important growth factors. Here at Get Your Boom! Back we are committed to Genuine Ingredients At The Right Dose And Always Honest Pricing. Sources of B1 include wholemeal cereal grains, seeds (especially sesame seeds), legumes, wheatgerm, nuts, yeast and pork. In Australia, it is mandatory that white and wholemeal flour used for bread is fortified with thiamin. Thiamin deficiency is generally caused by a poor diet or excessive alcohol. Symptoms include confusion, irritability, poor arm or leg (or both) coordination, lethargy, fatigue and muscle weakness. ‘Wet’ and ‘dry’ beriberi are caused by thiamin deficiency and affects the cardiovascular, muscular, gastrointestinal and nervous systems. A person with ‘dry’ beriberi also suffers from a damaged nervous system and may have nerve degeneration, nervous tingling throughout the body, poor arm and leg coordination, and deep pain in the calf muscles. Symptoms of ‘wet’ beriberi relate to the cardiovascular system and include an enlarged heart, heart failure and severe oedema (swelling). Wernicke-Korsakoff syndrome (also called ‘wet brain’) is a thiamin-deficiency disease linked to alcohol excess and a thiamin-deficient diet. Alcohol reduces thiamin absorption in the gut and increases its excretion from the kidneys. Symptoms of the disease include involuntary movement of the eyeball, paralysis of the eye muscle, staggering and mental confusion. B2 is primarily involved in energy production and helps vision and skin health. Sources of riboflavin include milk, yoghurt, cottage cheese, wholegrain breads and cereals, egg white, leafy green vegetables, meat, yeast, liver and kidney. Riboflavin deficiency (ariboflavinosis) is usually seen along with other B-group vitamin deficiencies. People at risk include those who consume excessive amounts of alcohol and those who do not consume milk or milk products. Symptoms include an inflamed tongue (painful, smooth, purple-red tongue), cracks and redness in the tongue and corners of the mouth, anxiety, inflamed eyelids and sensitivity to light, hair loss, reddening of the cornea and skin rash. B3 is essential for the body to convert food into energy. It helps maintain skin health and supports the nervous and digestive systems. Unlike other B-group vitamins, niacin is very heat stable and little is lost in cooking. Sources include meats, fish, poultry, milk, eggs, wholegrain breads and cereals, nuts, mushrooms and all protein-containing foods. Niacin deficiency (pellagra) – people who drink excessive amounts of alcohol or live on a diet almost exclusively based on corn are at risk of pellagra. Others causes are associated with digestive problems where the body does not absorb niacin efficiently. The main symptoms of pellagra are commonly referred to as the three Ds – dementia, diarrhoea and dermatitis. Other symptoms include an inflamed and swollen tongue, irritability, loss of appetite, mental confusion, weakness and dizziness. This disease can lead to death if not treated. B5 is needed to metabolise carbohydrates, proteins, fats and alcohol as well as produce red blood cells and steroid hormones. Sources include liver, meats, milk, kidneys, eggs, yeast, peanuts and legumes. B5 deficiency symptoms include loss of appetite, fatigue and insomnia, constipation, vomiting and intestinal distress. B6 is needed for protein and carbohydrate metabolism, the formation of red blood cells and certain brain chemicals. It influences brain processes and development, immune function and steroid hormone activity. Sources include cereal grains and legumes, green and leafy vegetables, fish and shellfish, meat and poultry, nuts, liver and fruit.. There is some evidence that vitamin B6 may be useful in the treatment of carpal tunnel syndrome and PMS. Pyridoxine deficiency is seen in people who drink excessive alcohol, women (especially when on the contraceptive pill), the elderly and people with thyroid issues. Symptoms include insomnia, depression, anaemia, smooth tongue and cracked corners of the mouth, irritability, muscle twitching, convulsions, confusion and dermatitis. Most supplements use the much cheaper cyanocobalamin, @ $1,800/kilo, instead of the much more expensive MecobalActive® B12 Methylcobalamin @ over $3,000/kilo. MecobalActive B12 Methylcobalamin is absorbed much more effectively by the body. Vitamin B12 helps to produce and maintain the myelin surrounding nerve cells, mental ability, red blood cell formation and the breaking down of some fatty acids and amino acids to produce energy. Sources include liver, meat, milk, cheese and eggs, almost anything of animal origin, soy products, fortified cereals (choose an organic, non-GMO brand), fortified almond milk (brands vary), fortified coconut milk (brands vary), some vegan protein powders, and two of the best sources are nutritional yeast and spirulina. Although it’s possible to obtain all the B vitamins you need from vegan foods, you should take specific caution to take a Vitamin B12 supplement if you don’t consume at least one teaspoon of spirulina per day or at least 1-2 tablespoons of nutritional yeast per day. Both those sources in the specified amounts provide over 100% of the daily values. Vitamin B12 deficiency is most commonly found in the elderly, vegans and breastfed babies of vegan mothers. Symptoms include tiredness and fatigue, lack of appetite, weight loss, heart palpitations, shortness of breath, vision loss, smooth tongue and mental problems, such as depression and memory loss. Getting sufficient amounts of B vitamins inside your body is important for the normal functioning of vital organs and body functions. You should remember that all B vitamins are water soluble, so you need to be constantly supplying them to your body. To Get Your Boom! Back with AminoSerene click on the big pink Buy Now button at the top of the page.